Early in the 20th Century, the community of Cove decided to tell the world about the quality and abundance of cherries, prunes, and apples, and fields of raspberries and strawberries. When the Cove Cherry Fair was established, the predominant orchard crops were cherries. Cherries were sorted and packed for shipment to the eastern markets in iced railroad cars, and other fruits were sold throughout eastern Oregon. 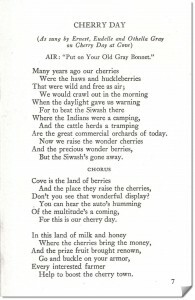 Growers established the Cherry Fair as a way to advertise Cove’s cherries in celebration with the community. A caravan of Cove residents traveled to other Union County communities to announce the first Cherry Fair. A Royal Court of young adults reigned over early Cherry Fairs, with King Bing and Queen Anne selected to be rulers of the day. Activities included a parade through the streets of Cove, musical performances, and poetry readings. Prominent speakers included Oregon governors, such as former Cove resident T. T. Geer, and other dignitaries. Joaquin Miller, noted Oregon poet, was an honored speaker at one of the fairs. To round out the afternoon activities, a sumptuous dinner was followed by a baseball game, which Cove’s team usually won. Ceremonies ended with a community dance. The Cove-Union railroad ran a number of special excursions during the Cherry Fair, and hundreds of visitors from throughout the Grande Ronde Valley joined in the celebrations. 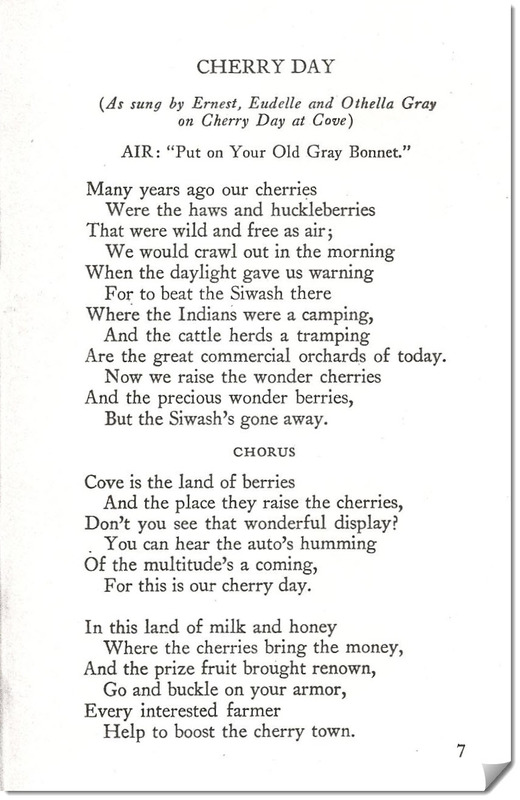 America’s entrance into World War I diminished the interests and resources to continue the Cherry Fair. 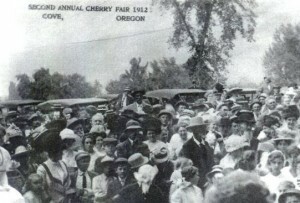 In 1918, Cove held its last Cherry Fair. 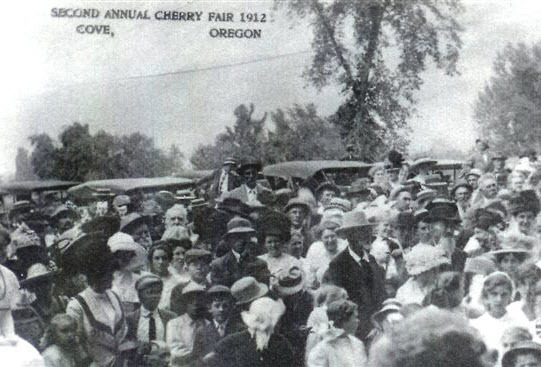 Eight-one years later, in 2000, the Cove Community Association established the Cherry Fair to celebrate the community, to recapture the sense of community pride and unity characteristic of early Cherry Fairs. Each year, the community comes together to treasure its past and look forward to the future. Local citizens, guests, and visitors from all around enjoy the warmth and welcome that characterizes so many small communities throughout Oregon and much of our great nation. Be sure to check out the Cherry Fair page for current info and plans for the next event.